The group will begin with Tennis Clinic led by seasoned pros, followed by a friendly Tennis Round Robin. The men’s and women’s Tennis Clinic and Round Robin will be held Sunday afternoon, the clinic from 1:00 pm -2:00 pm followed by Round Robin from 2:00 pm– 4:00 pm. The price is $85.00 and includes refreshments. Please include your fee and indicate your level of play on the Registration Form. 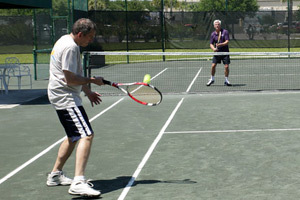 If you need to rent a racquet, please rent it at the Eau Palm Beach Resort Tennis Pro Shop. Racquets are $11.00 to rent. The tennis center is located on the resort. There will be no lunch served at this activity. Please plan to meet in the Hotel Lobby at 11:15 a.m. for Transportation, Buses will depart promptly at 11:30 a.m. Tee Time 12:30 p.m. Golf Chairman: Tom Weihsmann, Kaman Industrial Technologies Corporation and Doug Savage, Bearing Service, Inc. The golf tournament to follow an open-play, four-person scramble format. Tee time is 12:30 p.m. 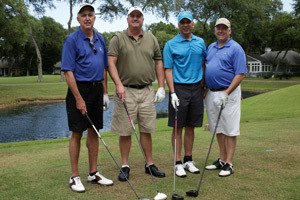 The registration fee of $295.00 includes transportation, golf, cart, practice balls, boxed lunch, tax and gratuity. The golf tournament will be played on the Champion Course at the PGA National Resort & Spa. Beautifully groomed fairways and fast greens have inspired championship play at PGA National since its opening in 1981. Decades of dramatic PGA Senior Championships, the dynamic Ryder Cup, and years of exciting PGA Honda Classic challenges have made PGA National the premier host of many of golf's most memorable moments and famous players. Relive these when you play at PGA National Resort. Transportation will depart from the hotel at 11:30 am, please arrive by 11:15 am. If you would like to store your golf clubs at the hotel, the fee is $4.00 per bag. Golfers should at all times dress in a manner appropriate. Men and Women must have a shirt with collar, long pants or walking shorts. T-shirts, tank tops, athletic shorts, cut-offs or jeans of any are not appropriate. Metal spikes are not allowed at the PGA. Let BSA handle your golf club rentals! Please indicate in your registration if you would like golf club rentals for the tournament. Let us know your preference for right-hand or left-hand, men's or ladies, and we'll handle the rest. Golf club rental requests must be submitted on or before April 4th. Club rental fees are $85.00 for the golf tournament. Please plan to meet in the Hotel Lobby at 12:00 p.m. for Transportation, Buses will depart promptly at 12:15 p.m. Fishing Chairman: Todd Hamlin, DXP Enterprises, Inc. Enjoy a day on the open water, as you try to hook one of Florida's well known fish from tarpon to snook and barracuda to snapper. You'll troll up and down the Intercoastal while sliding off onto the hidden inlets in pursuit of the perfect catch. 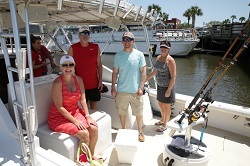 Today it doesn't matter if you're a beginner or a pro; your captain will guide you through the catch and release activity and everything you need to know about fishing the waters of South Florida. Light colored comfortable loose-fitting clothing that breathes and comfortable shoes. Don't forget sunscreen. © 2019 Bearing Specialists Association. All rights reserved.